Onions again? Yep, another dish laden with onions. Small onions, or shallots if you prefer, this time. The internet is a really convenient way to find recipes, so much that it seems unnecessary to actually buy the books. I'm not moved by convenience, however. I really like my books! And if I have to flip countless pages just to find the perfect chicken recipe, I would and I did! That's how I landed myself on Page 55 of Gordon Ramsay's Great Escape - Southeast Asia. It was a recipe for Orange and Ginger Caramelised Chicken Wings but I've tweaked it a little. Well, more than a little. I used brown sugar instead of white, added ground nutmeg, grated the ginger and increased the portion of some ingredients. I also did not sear the chicken on a pan in oil. Instead I chose to bake it before and after. 1) Season chicken wings with salt, black pepper and ground nutmeg for at least 30 minutes. 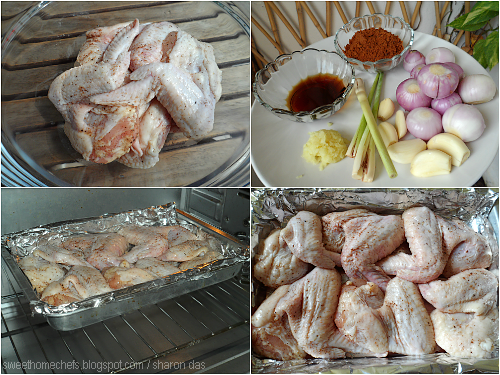 2) Arrange the wings in a layer on a baking tin. Bake in a preheated oven for 20 minutes at 170C. 3) Heat oil in pan. 4) Add onions, garlic, ginger and lemongrass. Stir for a couple of minutes on high heat. 5) Add fish sauce and sugar. Mix well. 6) Add orange juice and water. Stir until it has thickened a little, into a nice looking sauce. Switch the heat off and leave aside. 7) Remove chicken from oven. 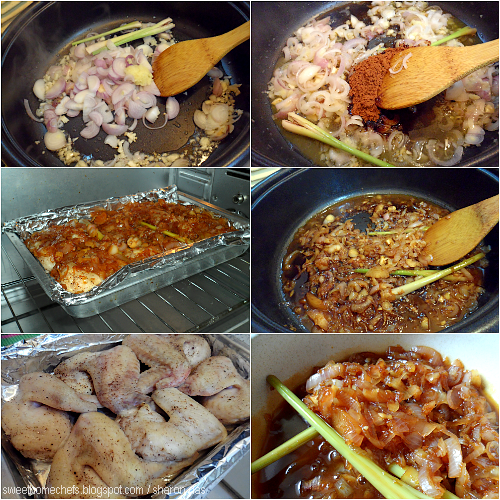 Spread the orange and onion sauce over the half-cooked chicken wings. 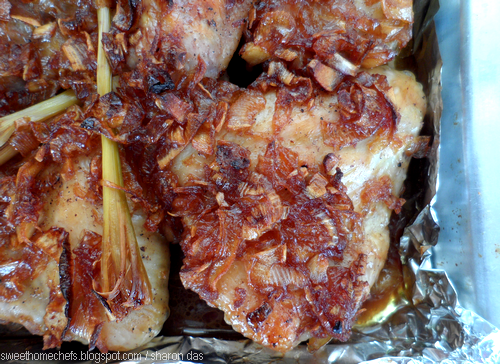 8) Continue baking for 45 minutes at 170C or until chickens are cooked and the onions are golden brown. Baste once in between. 9) Garnish with flat leaf parsley! Arrange wings in a layer, Bake in pre-heated oven. Spread onion and orange sauce over wings and continue baking. This is best enjoyed with rice. Orange and Onion Caramelised Chicken Wing on the plate! 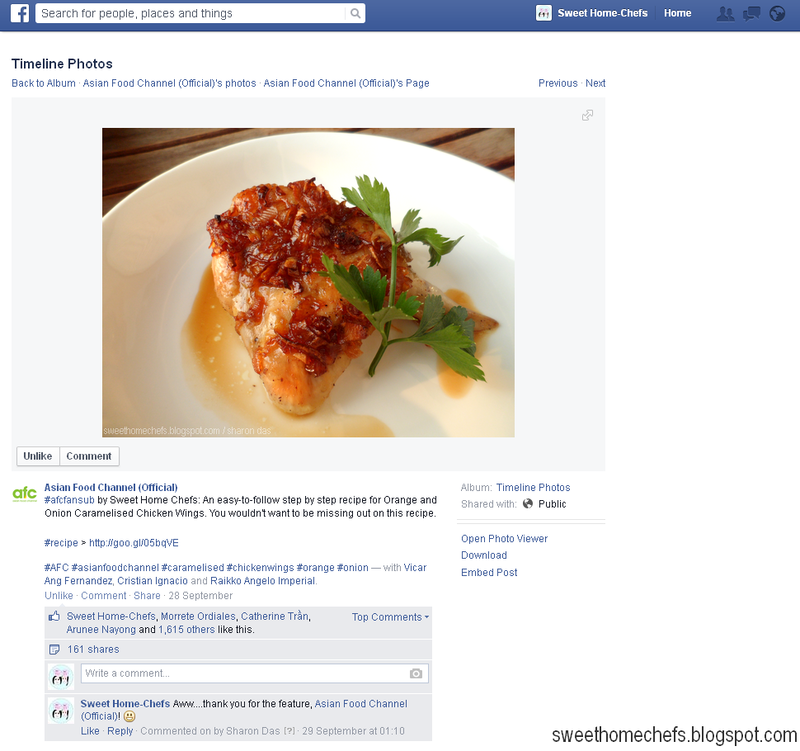 September 28, 2014 - This recipe was featured by Asian Food Channel on their Facebook and other social media pages. damn delicious, finger licking good citrusy, sticky and spicy chicken!!! 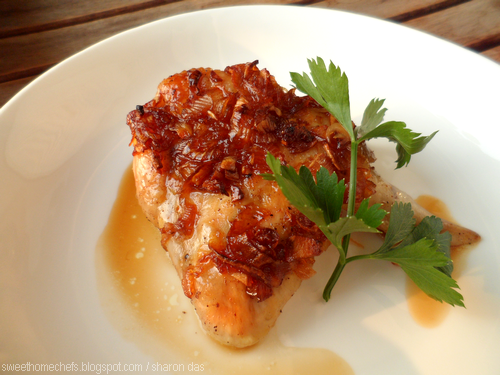 Oh Sharon, these chicken wings, look extra tasty...I love the caramelized onion on int...delicious! Thank you, Juliana. You have a great week! I found it really tasty and juicy. Oh, those are onions on top :D Certainly love the look of it, dear! A generous amount of it, Shirley ;) Thanks! I remember this recipe! This is one of best Gordon Ramsay's recipes and also chicken wings recipes that I have tried. 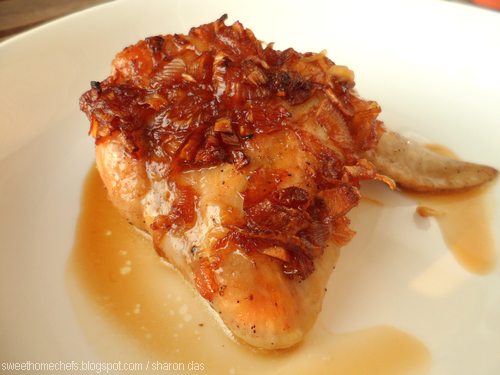 I love the flavor (and smell) that caramelized onions bring. 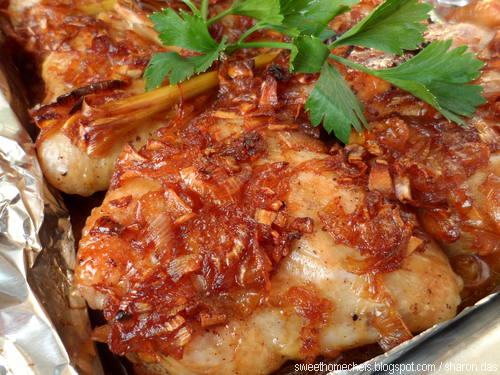 I like the idea of the bright citrusy favor against the smoky onions mmm!